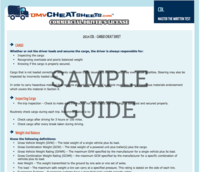 The included study material consists of a online practice tests that cover all required study material to study for the written test for a Class A CDL license. Applicants for a Class A CDL license must be proficient in material from the General Knowledge section of the manual (Sections 1, 2 and 3), Air Brakes (Section 5), and Combination Vehicles (Section 6). The written test must be passed before applicants can proceed to take the pre-trip inspection test or the driving skills test.